On Monday, President Obama spoke outside the White House, defending the roll-out of his signature legislative achievement, ObamaCare, aka the Affordable Care Act. 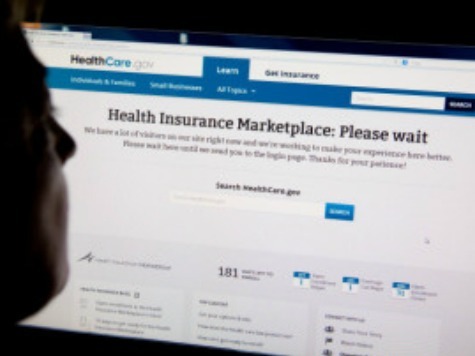 He dismissed growing concerns about the launch of the health insurance exchanges by noting that the law “is not a website.” As National Journal noted, however, launching the website was the “easy part.” ObamaCare can go downhill very quickly. Team Obama built the most sophisticated voter database and on-line political community in history. Its comprehensive voter outreach operation was able to defy political odds, recreate its turnout breakthroughs from 2008 and win reelection. If Team Obama has any core competency, it is building a seamless, integrated on-line community. Yet, three weeks after introduction, the HealthCare.Gov website is such a disaster that a single person signing up for coverage in Delaware is noteworthy enough to introduce the President for Monday’s remarks. The White House has reacted to the very real problems with the on-line exchanges by announcing a “tech surge.” Tapping the best software engineers from the private sector will likely bring near-term improvements to a website that was three years in the making. After several weeks or months, the on-line exchanges will probably be fully functioning. The “kinks” and “glitches” will get worked out. Then, however, the real problems with ObamaCare will come to light. The foundational problem with ObamaCare is that is relies on people making economically irrational decisions. Namely, young and healthy individuals, who consume very little health care, have to be convinced to buy insurance to subsidize new coverage mandates for older, less healthy consumers. If the young and healthy don’t buy coverage, the premiums for everyone else will skyrocket. The Obama Administration insists that it can’t provide exact numbers of individuals who have signed up for coverage through the exchanges. I have no doubt, however, that the Obama campaign operation could, with great granularity, provide the exact number of left-handed voters who oppose the Keystone Pipeline in every precinct in the country. It strains credulity to think that they don’t have information on the exchanges in real-time. The National Journal notes that the White House chalks up many of the website’s problems to an overwhelming demand for health coverage. There is, no doubt, some amount of truth to that. The problem, again, is that ObamaCare only “works” if people who don’t really need health insurance coverage buy it. The harder it is to navigate the system, the less likely it is that they will purchase coverage. The relatively unhealthy or those with pre-existing conditions have an incentive to spend hours working through the system. The “golden calfs” who make the accounting work, do not. A recent paper by the National Bureau of Economic Research found that tax cuts and direct assistance to low-income Americans would have been far more effective than Obama’s failed stimulus package. The paper found that the stimulus, enacted just months into President Obama’s first term was particularly ineffective as a means to boost the economy. Not only did it not help the economy, it arguably made the economy worse. Policy decisions represent choices. Three years ago, there was a great need to reform our nation’s health care system. It had become terribly distorted as a result of past government interference. Like the stimulus, ObamaCare preserves the worst of government’s past intervention and extends it now through the entire economy. Obama is right. ObamaCare is not a website. It is far worse.